Honestly, these fish are so fresh-looking and smiley, how can I cook them? Their little eyes are staring up at me as if to say, “Put us back”! No way. 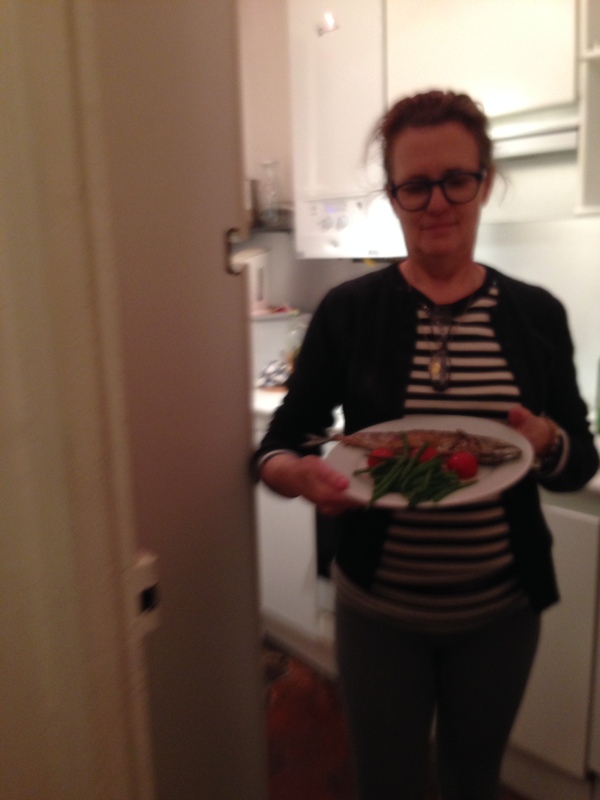 Summoning my courage I proceeded into my less than closet sized kitchen to cook these mackerel WITH THE HEADS ON. Yikes. Thank you, Jamie Oliver. Browsing through recipes, there had been one for crispy mackerel. I liked the sound of crispy. Jamie assured me that mackerel are delicious and that I should be eating them because tuna are over-fished. I reminded myself of my vow to cook something new, something French, every week. I steeled myself and put Georges et Ludovic (yes, I had been staring at them so long that by now they had names) into the hot oil, and started to cook. 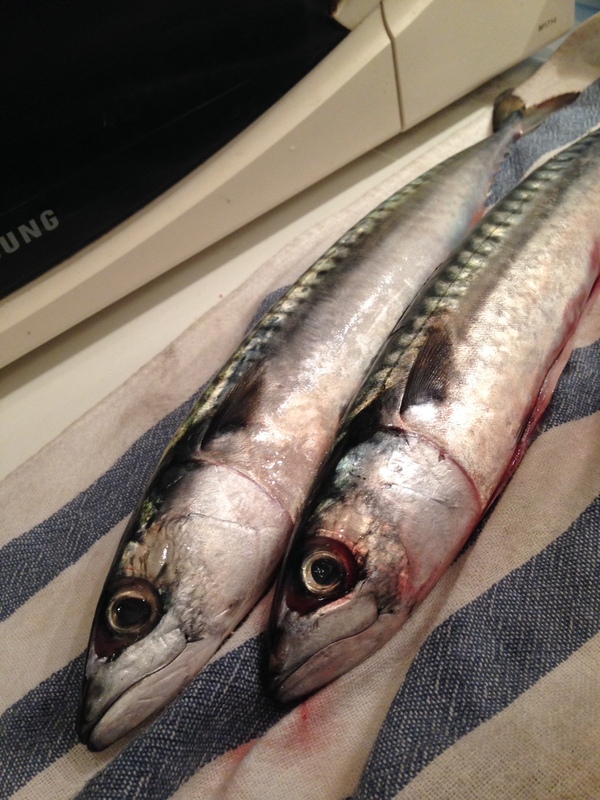 They did not smell bad, as I had been told mackerel does. In fact,they seemed to be looking crispy. I flipped them and went to my go-to additive of white wine. When in France, I add 3 euro/bottle cooking wine to just about everything. That plus creme fraiche does the job and you can’t miss. In went the wine and that’s when it went up. In flames. I have never had the flame effect with white wine, but as the flames rose, I didn’t have time to think about that. “Uhhh, anything I can do?” Alan said, sticking his head in the door. I appreciated his tact. We were both thinking, OMG, we’re going to burn the building down. At least we’ll get to meet the Sapeurs-Pompiers, I mused, and ask them why they have two jobs here instead of just one like firemen everywhere else. But after a moment of useless blowing, the flames went out and the fish were indeed looking crisp. Frazzled chef, very crispy mackerel. Dinner very, good. Don’t try this at home. 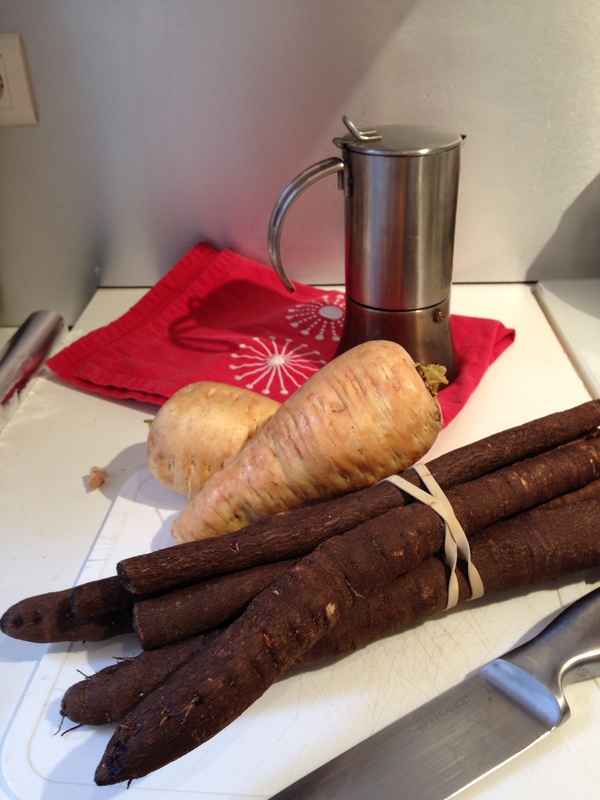 You probably recognize parsnips in the photo (like a fat white carrot) but what the heck is that bunch of black sticks held together with a rubber band? That, friends, is salsify. I’d heard of it, but never cooked it. I had seen it packed in water in small decorative jars on gourmet shop shelves but never bought one. I had to ask the market stall vendor how to prepare them. Apparently, simple as peeling and slicing and roasting. I could do that. What the vendor didn’t explain is that when you peel and slice the salsify it exudes a weird glue-like substance akin to rubber cement. It does not wash off with soap and water. It just sits on your fingers, tacky and black. Finally what worked was Parisian jet pads, not a recommended beauty treatment for my already dry skin. I guess the Parisian home chef must overlook these little contre-temps if she wants to achieve authentic Parisian deliciousness. 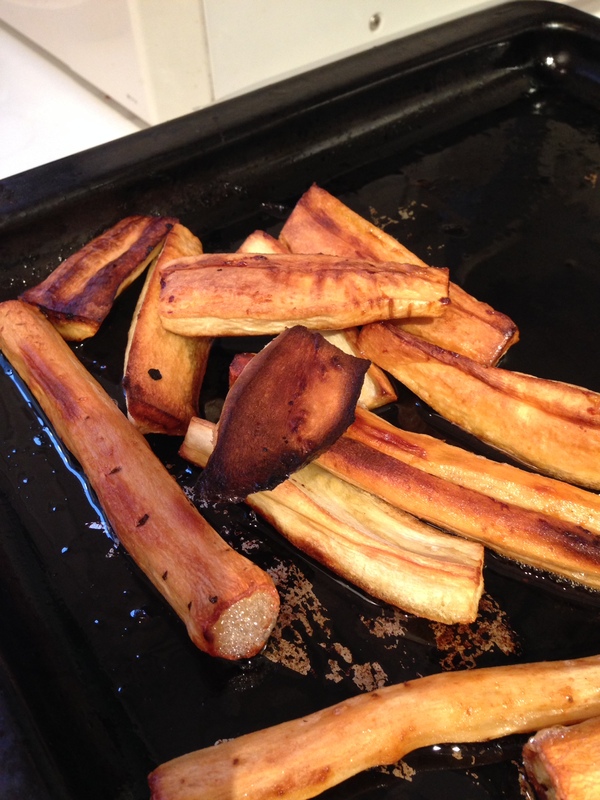 Here’s how they came out, roasted together with the parsnips. Admit it, delicious, no? I picked one up with my sore finger tips and appreciated the nutty, toasty flavours. Next week in Weird Food Wednesday: Queue de Veau and Osso Bucco de Dinde. This entry was posted in cooking, Food, France, Humour, Jamie Oliver, Paris, Problems by christinestonehewer. Bookmark the permalink.